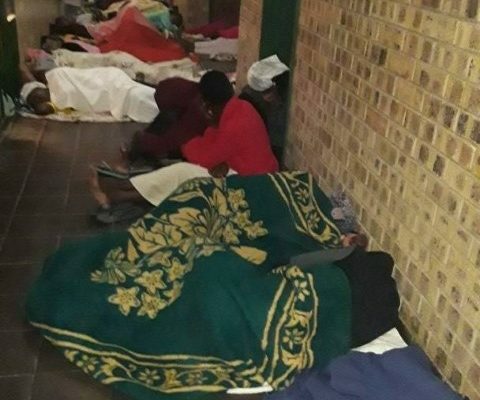 Students from Ehlanzeni TVET college were kicked out of their accommodation on Sunday and had to sleep on the floor of a police station. Progress has been made since students from Ehlanzeni Technical and Vocational Education and Training (TVET) College were kicked out of their private residential buildings by landlords on Sunday over unpaid rent. After the students were reportedly forced to sleep on the floors and benches of Acornhoek police station in Mpumalanga, a delegation from the National Student Financial Aid Scheme (Nsfas) visited the institution’s principal and chief financial officer to resolve the matter. The delegation said they paid R4,521,550 from the Nsfas Wallet for over 2020 students last week. Nsfas said that the backlog started when they made an upfront payment to Ehlanzeni TVET College for the first disbursement of allowances for students in February. This was done on the understanding that the institution had the capacity to distribute the money. Instead, the institution was not able to do so and it contacted the Nsfas to inform it of this development. The Nsfas then took over using the Nsfas Wallet to pay the students. A student activist and Student Representative Council member said the students had now returned to their accommodation. The Nsfas was still in the process of giving students allowances, the activist added. Nsfas spokesperson Kagisho Mamabolo said: “Fifty-three universities and TVET colleges agreed to administer direct payments of allowances to their students, while 23 TVET colleges have opted to be on the NSFAS Wallet, which means students will receive direct payment from NSFAS.